A Biff in GTA IV. You may be looking for Biff Rock, a character in Grand Theft Auto Advance. 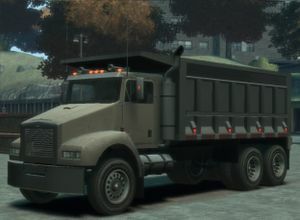 The HVY Biff is a large truck featured in Grand Theft Auto IV and Grand Theft Auto V.
Closely resembling a Kenworth T800, the Biff is a conventional cab truck used in construction and industries commonly encountered in industrial districts in the game. The Biff is available in different configurations in flat-bed form, or two types of hopper designs, each filled with gravel. GTA IV, rear quarter view, with a different dump truck bed. GTA IV, front quarter view of a flat bed variant. GTA V, front quarter view with a dump truck bed (Rear quarter view). Due to its size and weight, the Biff is predictably slow, but is more than capable of ramming traffic without sustaining too much damage itself. Its top speed is 74 mph, or 120 km/h. The Biff's size is exploited during Derrick McReary's "Tunnel of Death" mission, when two such trucks are used to block a section of the Booth Tunnel from both sides. After collecting all thirty cars for Stevie, he agrees to purchase cars from Niko Bellic, with the Biff fetching $4,000. The default radio station of the Biff is San Juan Sounds. During the mission Diamonds Are a Girl's Best Friend after getting ambushed the diamonds are thrown into the back of one of these trucks. In The Lost and Damned there are remains of unused coding of "biff2" variant. It is unknown what could it be during development, but may have featured something different other than the dump-truck and flat-bed variants. The truck's name is a reference to the character "Biff" from the "Back to the Future" trilogy. In "Back to the Future", Biff's car slides and crashes into a dumptruck filled with animal manure. On close inspection of the windshield when dirty, the truck appears to have wiper tracks as every other civilian car, however the wiper blades are positioned differently, which would've made a totally different wiper track. Two Biffs can be found in a construction site near Gainer Street, South Bohan, Bohan. The Biff can usually be found driving round Acter Industrial Park in Alderney. A Biff can be seen blocking a street near the construction site where Ivan tries to escape in the mission Ivan The Not So Terrible. It has no driver, so the player is able to easily take it. This page was last modified on 26 December 2013, at 23:43.